This morning I finally completed my kid's Christmas present! Okay, it's two weeks late, but still... it's done, the kids and I are all happy! 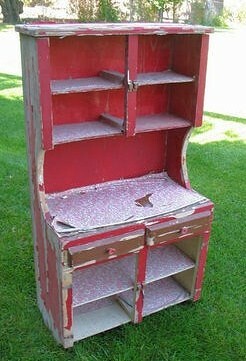 Remember the vintage children's hutch I found on my local online classifieds for $5? Dollar store cooling racks cut down to size, duct taped and hot glued in place. Center cut out of one door with plexiglass glued in it. 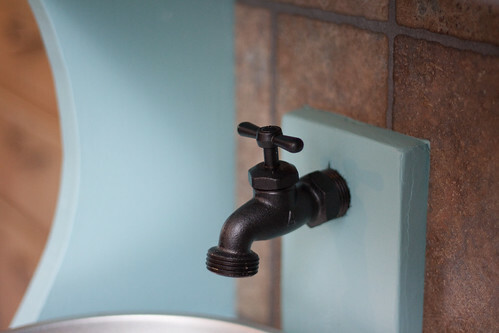 Home improvement store spigot for faucet (spray painted) and vinyl tile backsplash. 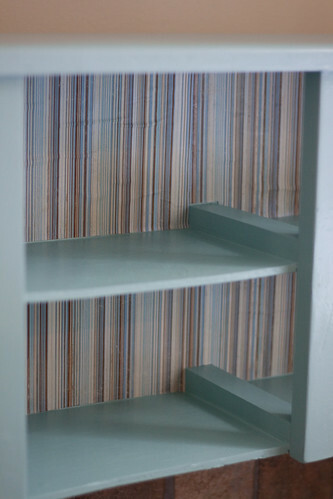 Tea stained paper lined shelves. Tip - use glue intended for paper, I didn't and got wrinkles. I had the kids wait in Seymour's room and gather the pots and pans that their aunt had given them for Christmas (since I told her I was going to give them the kitchen). Seymour waited very patiently while I brought it in and took a few quick pictures. Daisy waited a little while then came out and started playing with it. It wasn't a total surprise for them, but what can you do when you're with them all the time and they're not in school yet? Oh well. At least Seymour hadn't seen it since it was primed. 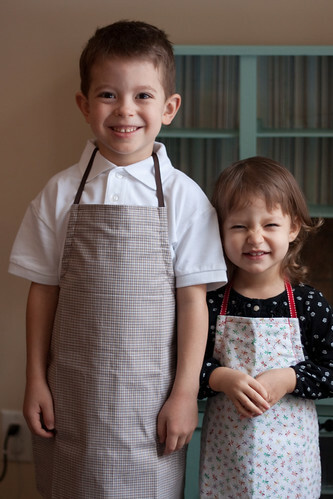 But they both love it and the aprons I made for them to go with it. I think the only thing I'm going to add are a couple small hooks on the side for the aprons. Wooden knobs and 4" wooden disks for burners. Those Ikea dishes are the perfect size! Doesn't Daisy look like a little grandma with her hands like that? Not too bad in my opinion, especially for a completely custom, unique play kitchen! I love this. Great job. Holy Moly lady!! This is beautiful!! 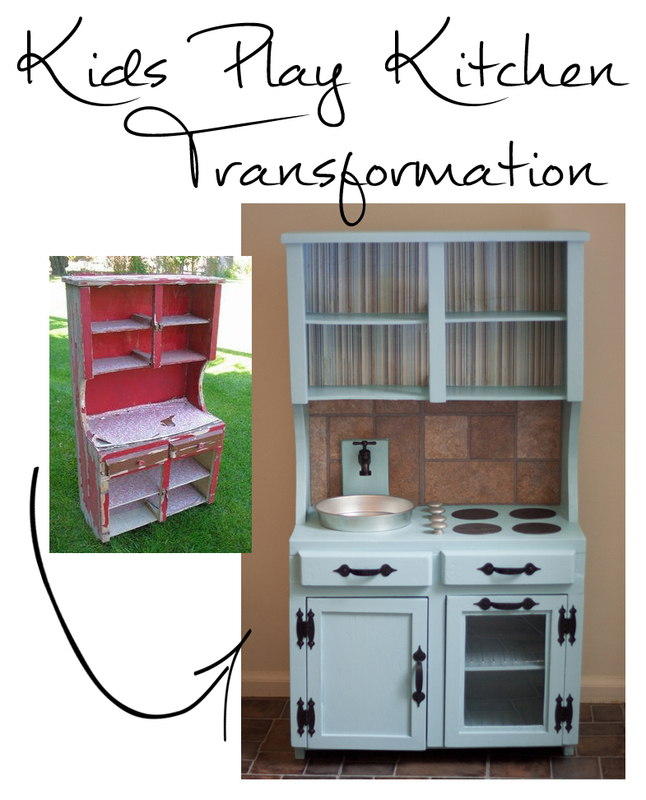 I think this is the best furniture transformation-kitchen set I have seen. It looks like you put lots of time into it. And I LOVE the price!! Congrats on the renovation. An excellent job. I just love her crinkled nose! 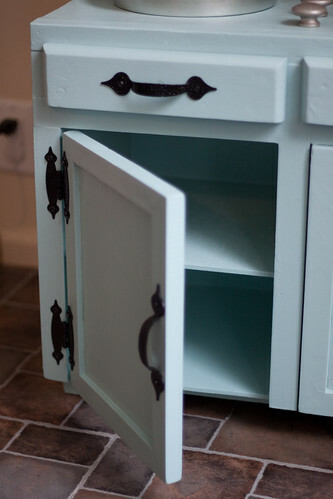 Great job on the hutch, it is very beautiful. 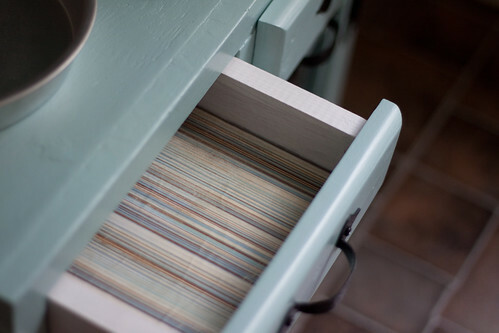 BTW, I have those same vinyl tiles in my kitchen :-) Love them! Amazing!! That is fit to be out in the family room on display! That's so cool! Your kids will have so much fun playing with it. Oh my word! This is incredible! 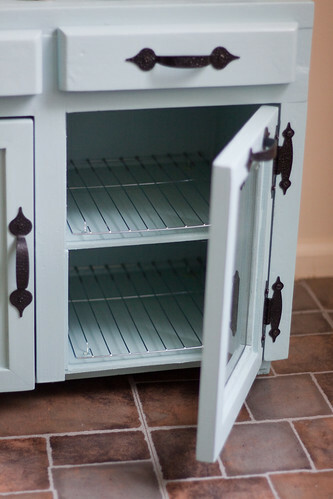 I am shocked at the "before" photo and the fact that you turned it into a very classy play kitchen that would cost an arm and a leg(Pottry Barn)for $27.60! You are my hero for sure. you can tell alot of hard work went into this and it definately paid off! Good Job! We just finished one of these for my daughter...I'll be posting it on my blog after her b-day! Yours is so cute, love the faucet. So Adorable!! I love it! These type of projects are so fun! Especially when your kids love it and play with it constantly! 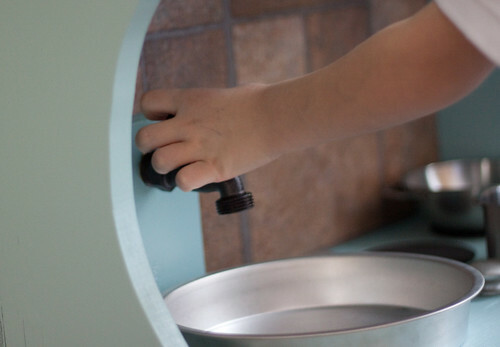 The aprons are a fun touch, and the faucet coming out of the wall is genius! I never would have thought of that. Thanks for sharing! Gorgeous! You obviously put a lot of love into this and I'm sure they will be enjoying it for years to come! Wow! What an amazing transformation! 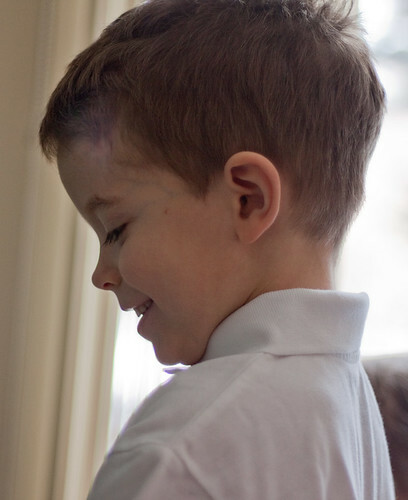 The kitchen is adorable, but not nearly as cute as your kiddos are! I love that picture of your little girl! Also love the paper you used and the backsplash! That is cute as pie! Love it. What a fabulous gift! I would have loved to make one when my big kids were little. If only had access to crafty blogs then. This is remarkably wonderful! Literally the most well done kids' kitchen that I have seen. I'm sure that your kids love it!! I love it! Where did you find that hutch? Did I miss that part? Are you kidding??? That is AMAZING, FANTASTIC, AWESOME and all the other words I use. That is possible the worst "before" and the best "after" I have ever seen. I am going to feature this on Thursday. Thanks so much for linking this up!!! What a darling kitchen center! You totally transformed this piece. The aprons and smiles are too cute! Nicely done! WOW. I can not believe the transformation! Nice work! Holy cow! You did a fantastic job! Congrats on hanging in there to the end. I stopped by from Under the Table and Dreaming. So glad I did! beautiful!!!!! you did a great job. 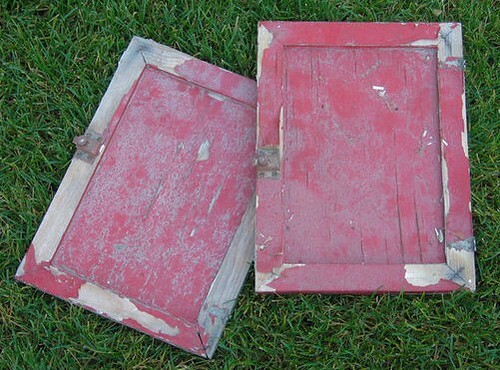 Catherine, I can't believe these are the same hutch! Such a gorgeous job. I love the color you painted it. So glad I came across your blog. I'm a new follower. Looks awesome! You did a fabulous job! it looks amazing!!! and your chilren are adorable! thanks for sharing! I love this! My little boy, 5, had actually asked for a kitchen for Christmas but I had already spent my limit. And, too, I didn't want to buy the standard ones sold in toy stores. This one is GREAT! You did a fab. job! Don't ever sell it. Even once they've outgrown it they will always treasure it. Thanks for sharing. wow! you did a wonderful job here! WOW!! What am amazing transformation! Love it! 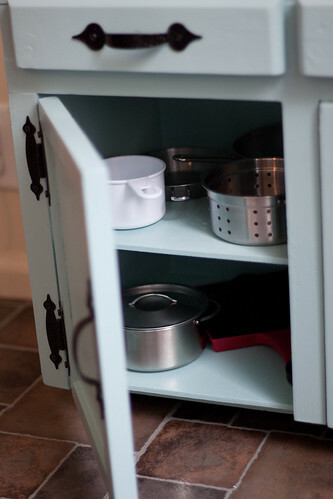 We did something similar for our 2 year old granddaughter only it was a nightstand that we turned into a kitchen. Amazing! 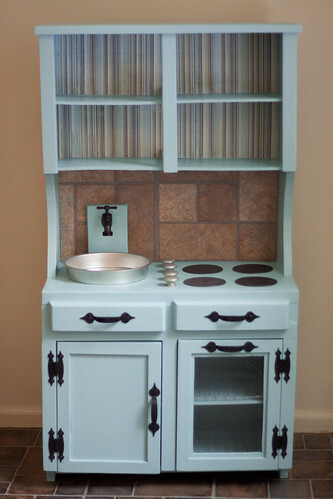 Now I would love to cook on this lol!. I wish my kitchen looked like that! O.M.G! I still can't get over this amazing transformation! 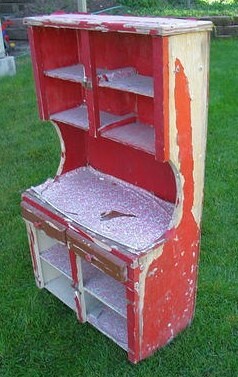 This makes me want to be a little kid again... way better than the plastic kitchen I played with as kid! I can't wait to show Mr. Woodsy this furniture transformation tonight! I know he will be swooning over it as well! I featured your project on Sew Woodsy today! 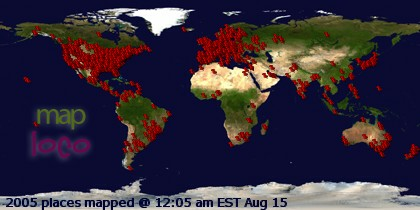 Thank you again for linking up! That is just the cutest thing I have ever seen. How creative. So adorable! 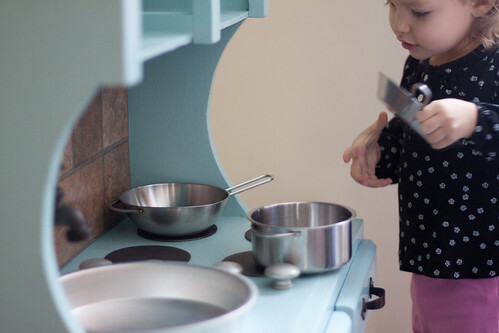 I've seen a few play kitchens around blogville but this is the CUTEST EVER. Great job! Take a bow...that is a FANTASTIC makeover!!!! This is so, so, so cute! I absolutely love it. Your children are so adorable too! Good job! WOW! That is so much better than the overpriced plastic versions at the store! Good job seeing the potential of that old $5 furniture piece. If you would like to share the Craft Gossip love and show your visitors you've been featured, you can grab a button here! This is my first time to your site and I love the expressions on your children's faces. What a fantastic memory you have created for them. I would have loved this when I was a little girl. Bravo!